The complete schedule of matches for this year's G1 Climax has been released with the lineups for all 19 shows. The tournament begins on Saturday, July 14th and will wrap up with three consecutive nights at Budokan Hall. 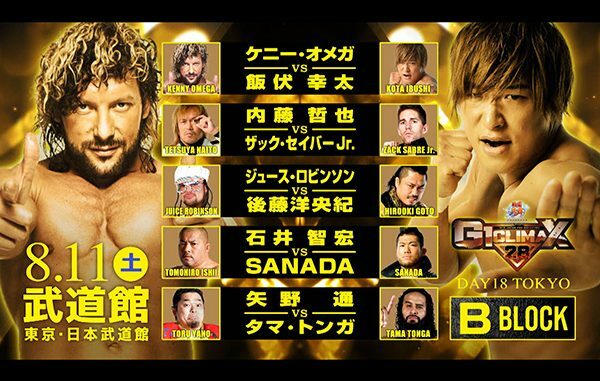 New Japan Pro Wrestling has announced the full cards for the upcoming G1 Climax tournament. The tournament will begin on Saturday, July 14th and wraps up with three straights nights at Budokan Hall. *Kota Ibushi vs. Zack Sabre Jr.
*Sanada vs. Zack Sabre Jr.
*Tomohiro Ishii vs. Zack Sabre Jr.
*Tama Tonga vs. Zack Sabre Jr.
*Kenny Omega vs. Zack Sabre Jr.
*Hirooki Goto vs. Zack Sabre Jr.
*Tetsuya Naito vs. Zack Sabre Jr.